Another asset of the University of Wisconsin is the Lakeshore Path, which hugs the shores of Lake Mendota, circling University Bay and reaching out towards Picnic Point (one of the most celebrated views in the city). The gravel path is actually two trails combined: The Howard Temin Path to the southeast and The Lake Mendota Path to the northwest. Together, they make up a 4 mile one-way run. The paths are a combination of paved and gravel surfaces, some sections wooded and others open with water views. One slight positive for runners: bicycling is not permitted on the Lake Mendota Path. The Howard Temin Path starts out at the University Boathouse and pier on North Park Street and hugs the coast until it reaches the intersection with the Lake Mendota Path near the University Bay Marsh (after about 1 mile). Take a right onto the Lake Mendota Path, which juts out 1 mile onto the peninsula of Picnic Point. This is the pinnacle of the views on this route, but you can continue on the path another 2 miles out to Frautschi Point and the Wally Bauman Woods. 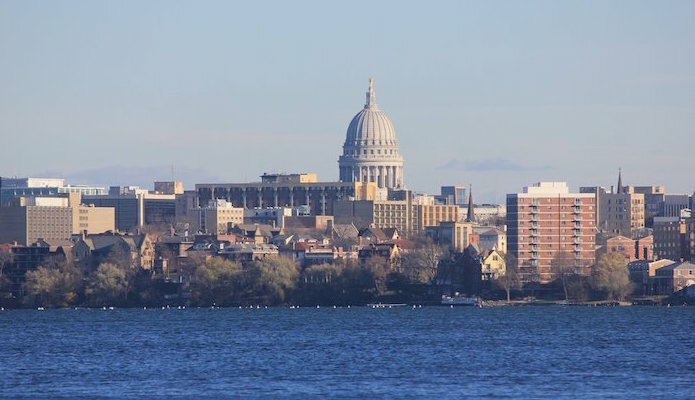 This route is especially popular with runners at the University for its proximity to campus, but anyone will enjoy the nice views looking back on Monona and the Lakeshore neighborhood. Add-Ons: Our State St. route is just south of the Lakeshore Path. Also, the University Campus and the area around it are very pleasant for running.